Halloween is only a few days away. Do you have your costume yet? 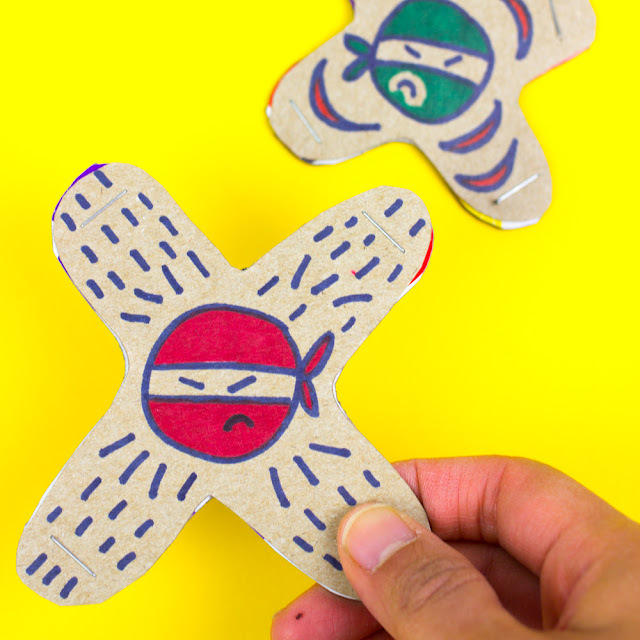 If not, I have a super fun (and cheap) cardboard costume that you can whip up to wear this Wednesday. 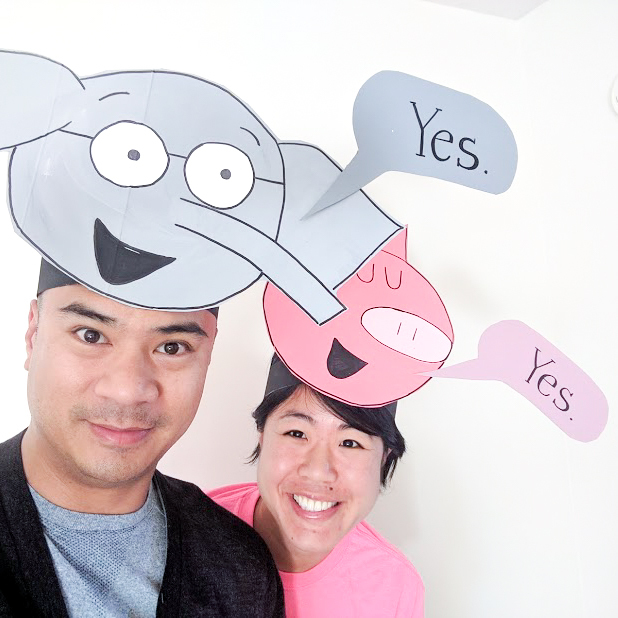 Today we're making Elephant and Piggie Costumes! Recently I received several containers of Tulip Glow Paint to try out. As you know, I LOVE making costumes for Chuck. 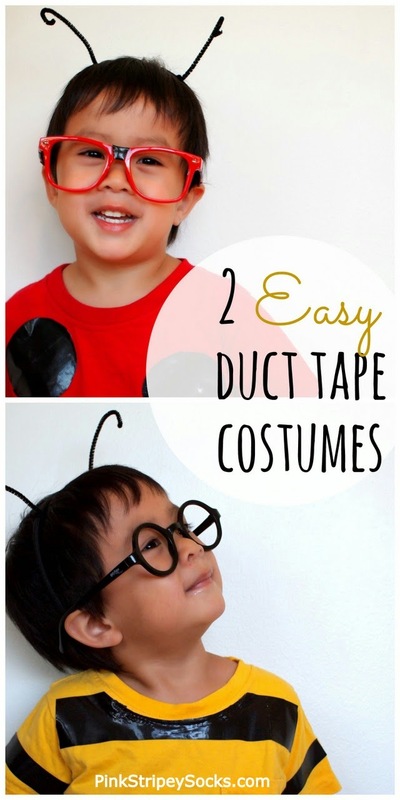 (Remember the spider costume, Lightening McQueen Costume, and Mr. Potato head costume? Yup. Good times.) So I was excited to somehow incorporate the glow in the dark paint into a costume idea. 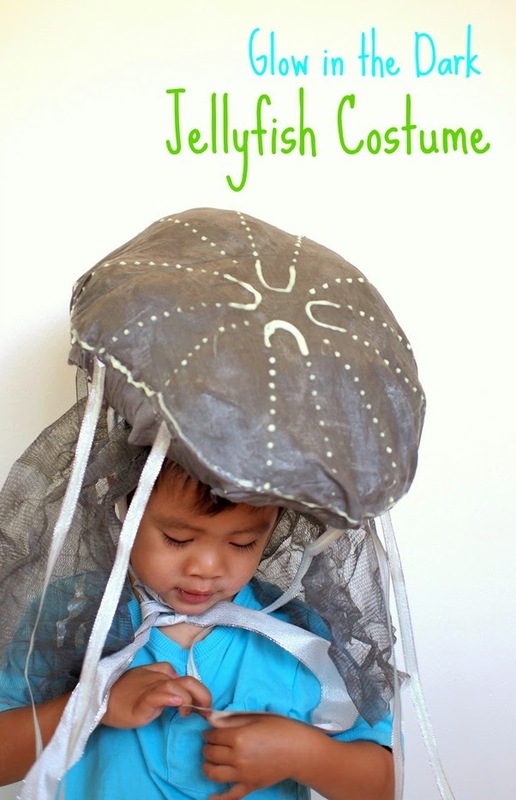 Chuck really loves sea creatures right now, so I made him this easy, NO SEW jellyfish costume. Oh yeah. And it glows! Adorable right? Just wait till you see it glowing. It really looks like a jellyfish is sitting on top of his head! 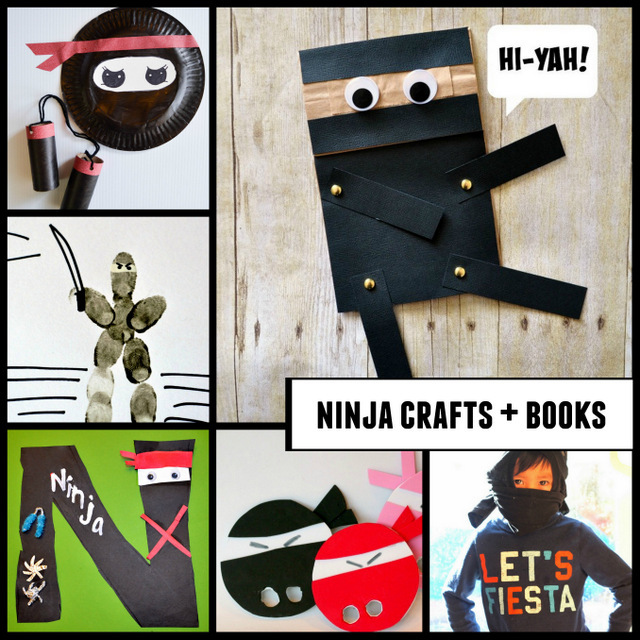 We really love reading and it's always fun to create crafts and activities to go along with our favorite books. Today I'm joining forces with other kid bloggers to present a Halloween Read and Play Blog hop! This means that today, over 25 kid bloggers are posting great activities and crafts to go along with Halloween themed books. (You can see links to all the great ideas at the bottom of the post!) 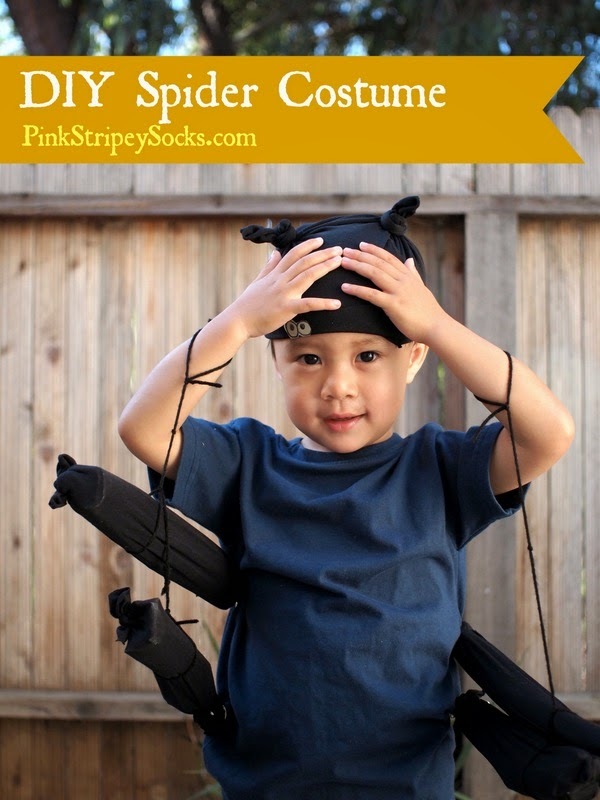 We made a DIY spider costume for our post. It was inspired by a beloved book character, Splat the Cat! Have you heard of the Splat the Cat Series? 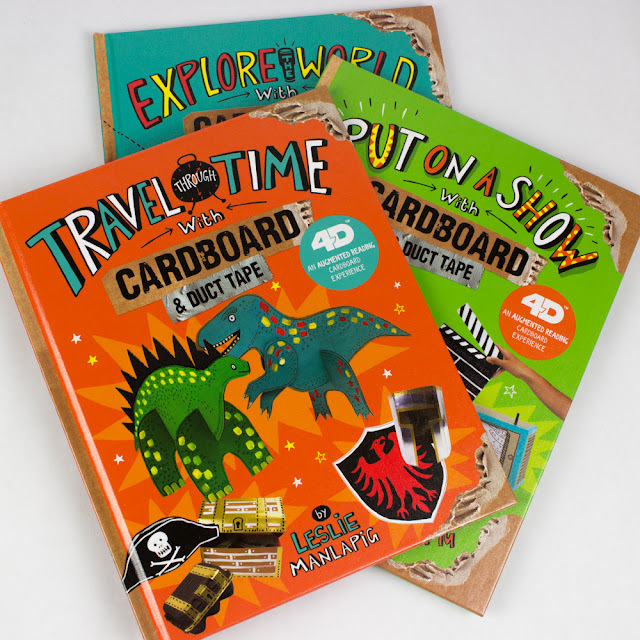 We love these books. For Halloween, we read Scaredy-Cat, Splat! I don't want to ruin the story for you, so here's just a snippet to explain today's craft. Splat the Cat's initial costume gets ruined and his mom has to quickly whip up a homemade spider costume from socks and string. I love the idea of making something from nothing, so we tried our hand at quickly whipping up a spider costume just like Splat the Cat's mom! 2 DIY Cardboard Fourth of July Hats! Fourth of July is in a couple of days. Now if you're like me, you probably just realized that fact just this week. (Oh wait... am I the only one is in a perpetual time warp and constantly forgets what day it is?) This year we plan on seeing fireworks with Chuck and I thought it would be fun to whip up some cute Fourth of July Cardboard Hats for us to wear. Can you believe that these 2 hats were made from cereal boxes, toilet paper rolls, and corrugated cardboard? 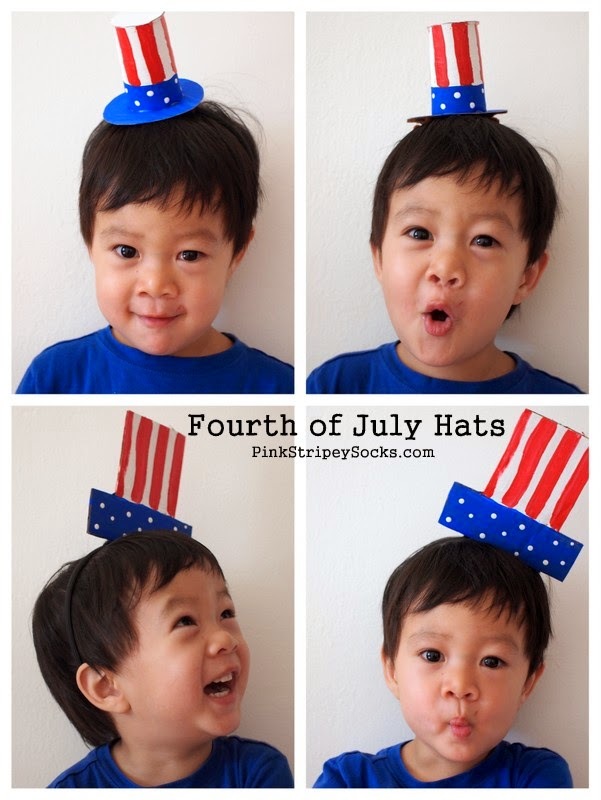 2 Easy DIY Fourth of July Hats! Currently Chuck loves pretending to be a fireman. He tells me that random things are on fire and then sprays them with an imaginary hose to put the fire out. To help encourage his play, we recently made this fireman's hat out of an old cereal box. Got a pretend firefighter in your family too? Curious to see how a cereal box turned into a fireman's hat? Keep reading to see how we did it! On Wednesday we're having a small holiday get-together with our toddler library group. I wanted to put Chuck in a cute holiday outfit, but I didn't get a chance to pick up anything yet. But not to worry! I had all the items needed to make these two cute reindeer antlers. I love how they came out. They're super festive, Chuck will actually wear them, (yes!) and added bonus- they were both made in one night.... my kind of craft! Wanna see how I made them? (Or, do you wanna see cute photos of Chuck modelling them?) If so, read on! Hope you have a wonderful and magical day! As promised, here are some photos of Chuck in his Lightening McQueen costume at a church party. And here are a couple of photos showing how I made it.